Synopsis: When desperados kill a preacher and his wife in a small frontier town, their foster child P.K. is forced to go on the run. P.K. must get a valuable letter to the Recorder’s Office before anyone else can get their hands on it. It’s not easy: Virginia City in 1862 is a glorified mining camp on a barren mountain above a great vein of silver. Seething with miners below ground and hustlers above, it’s a dangerous place, full of gamblers, hurdy girls, saloon-keepers and gunmen, all of them on the make. When twelve year-old P.K. Pinkerton arrives there, homeless, penniless and hunted, things don’t look good. But armed with a Smith & Wesson seven-shooter and a knack for disguises, P.K. takes on the tricksters and desperados who are out to get him and he finds possible allies: Sam Clemens, the new reporter for the paper, a gambler called ‘Poker Face Jace’ who knows how to tell if someone is bluffing, a derringer-packing Soiled Dove, and a Chinese photographer’s apprentice called Ping.Fast, furious and funny, an utterly entertaining mystery adventure from an author who never misses a beat. 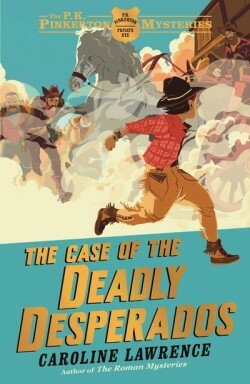 I came to read The Case of the Deadly Desperados with a certain excitement and apprehension – excitement because The Roman Mysteries were a large part of my childhood reading, and apprehension because I was worried that The Case of the Deadly Desperados, or more broadly The P.K Pinkerton Mysteries, would not be to the standard of The Roman Mysteries. The Case of the Deadly Desperados is different. It HAS to be different. I think that had it had any similarity to The Roman Mysteries, it would have felt a lot weaker, but Caroline Lawrence made a wise and (probably conscientious) decision to make the setting, period, and style very different to The Roman Mysteries. This difference affords The Case of the Deadly Desperados to become its own book and not just be “the new series by the author of The Roman Mysteries”. For one, Caroline Lawrence chooses a very interesting character to focus on. P.K. Pinkerton is half Sioux and half white, which makes him the target of much ridicule, but Pinky doesn’t really care. His father left him with a legacy and P.K. is adamant on following in his fathers rail-road detective footsteps all the way to Chicago to join the Pinkerton Detective Agency. P.K. is unique character- and I think most people will be able to sympathise with him. He evidently has an element of autism/Aspergers Syndrome, and he finds it extremely difficult to read and understand peoples’ emotions. This “thorn” means he is at an immediate disadvantage, but his strengths make up for that; P.K. can remember copious amounts of facts, and give him any two numbers and he can add, multiply, divide or subtract them in seconds- regardless of size. While The Case of the Deadly Desperados does not concentrate on the characters surrounding P.K. much, the supporting characters do offer variety and have their own personalities and traits which really brings them to life. Some of them are very stereo-typically- purposefully, I suspect- whilst others are not so obviously western-ised. The Case of the Deadly Desperados is written in first person, and again this was a very clever decision and really suits the story and characters. Caroline Lawrence really becomes P.K. as she writes this, really bringing out his unique character in her writing style. More than anything, the narrative voice is what really helps us understand and like P.K. – inclusive of his quirks (he frequently suggests that he is “partial to black coffee”, which I found quite amusing!). I never really considered myself a fan of Westerns (and this was probably another reason I was apprehensive of reading this). I always considered Westerns to be a genre for a different generation, but I must admit that The Case of the Deadly Desperados has convinced me to think differently. The plot and story are fast, fun, and unique- a wonderful mixture that really makes this a book and series worth reading. What did you think about The Case of the Deadly Desperados?